Detective Roberto Rivera died of illnesses he contracted after inhaling toxic chemicals and materials while working hundreds of hours at Ground Zero, the site of the terrorist attacks of September 11, 2001. 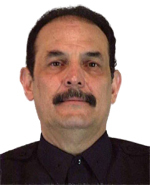 Detective Rivera had served with the New York City Police Department for 30 years and was assigned to the Joint Terrorism Task Force. He is survived by his wife, two sons and a daughter. Another year in Heaven my brother. I'm still here until I'm called where ever I'm suppose to go. I just hope it's the right place. Again, may you continue to rest in peace, and that your memory will always be alive by your loving family and the NYPD. Until we meet.